How do developing countries provide a new market for companies? Is it really possible to do very well by doing good? We continue our Leadership Hall of Fame series, a year-long look at the top business books and authors in recent history, with an excerpt from “The Fortune at the Bottom of the Pyramid” (2004) by the late C.K. Prahalad. therefore, do not represent a viable market. Indian economy is worth about $3.0 trillion in PPP terms. of Japan, Germany, France, the United Kingdom, and Italy combined. This is not a market to be ignored. 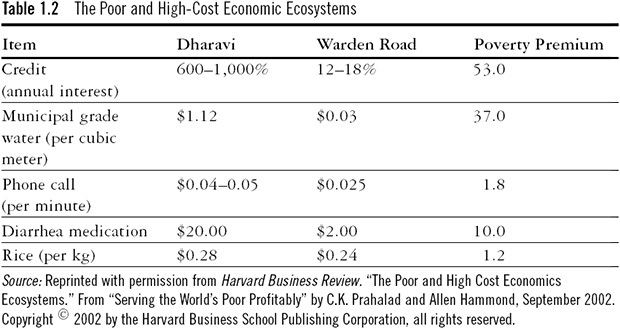 India, the poor pay a premium for everything from rice to credit. as 5 to 25 times what the rich pay for the same services (see Table 1.2). to this market can do well for itself by offering credit at 25 percent. do not represent higher risk. that can lead to efficiencies for itself and its potential consumers. percent of their income on connectivity. Reprinted by permission of Pearson Education, Inc. Publishing as Pearson Prentice Hall. 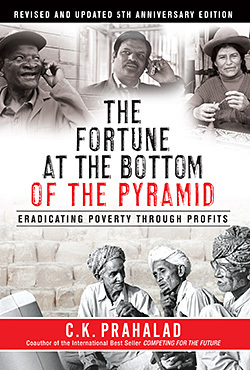 Excerpted from The Fortune at the Bottom of the Pyramid, Revised and Updated 5th Anniversary Edition: Eradicating Poverty Through Profits by C.K. Prahalad. Copyright 2009. All rights reserved. Read more from our Leadership Hall of Fame.